I was frequenting one of my bookstore haunts a couple days ago when I picked up The Craft of Baking by Karen DeMasco and Mindy Fox, which just happened to be sitting out on a feature shelf. It's not often that I find cookbooks that I like--I'm extremely picky when it comes to cookbooks, especially since bookshelf space is at such a huge premium in my small house. But, upon flipping through The Craft of Baking, I found myself immediately enamored by the simple recipes that stress the use of fresh and seasonal ingredients and the encouragement in the book right from the get-go to modify the recipes at the whims of your own creativity: that's my kind of baking philosophy! 3. In a small saucepan over medium heat, combine the milk, cream, sugar, and lemon zest. Bring to just a simmer. 4. Temper the egg yolks by pouring the heated milk mixture gradually into the yolks, whisking the entire time. Once the milk and yolks are combined, whisk in the lemon juice. 5. Strain the custard through a fine sieve into the eight prepared ramekins. 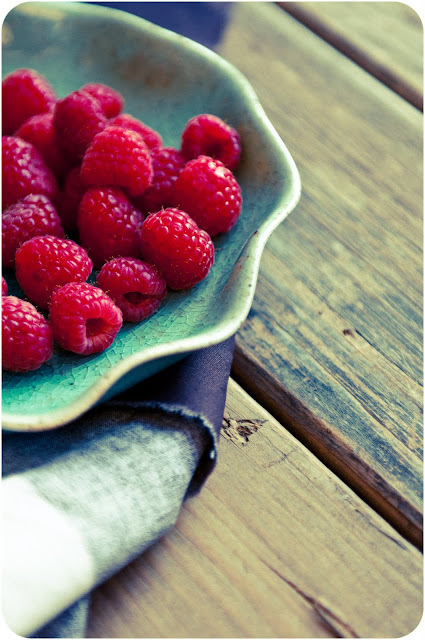 Place two to three fresh raspberries into each filled ramekin, gently pushing the raspberries under the surface. Cover the ramekins tightly with aluminum foil. 9. When you are ready to serve, sprinkle a thin layer of turbinado sugar on top of each custard and caramelize with a blow torch. 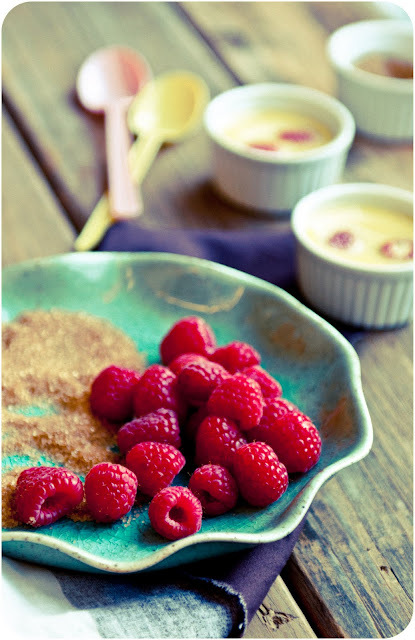 Serve immediately, topped with more fresh raspberries. I LOVE Craft of Baking! There's a fabulous recipe for coffee ice cream with cocoa nib brittle in there. Definitely my favorite way to use up yolks! I'm pretty sure there's no such thing as too much raspberry. It's one of my favorite dessert flavors, so really keep em coming! And creme brulee is one of my favorite desserts. A match made in heaven? I think so. @joanne: i'm right there with you about raspberries, but there are so many other great summer fruits out there to be used--i haven't even *touched* cherries yet this season! I also had a ton of egg yolks leftover this week! I used them to make a chocolate mousse that I'm using to fill a birthday cake this weekend. Before that, though, I was considering using them for 1) ice cream/semifreddo 2) pastry cream for a tart 3)a yellow cake (my recipe calls for egg yolks in addition to whole eggs) or 4) a chocolate custard/creme brulee. I'm not a fan of mayo, but you could also make your own with the egg yolks. You could make hollandaise sauce or variations thereof (bearnaise, noisette, mousseline, etc.) if you feel like making dinner fancy. Can you tell that I've spent a lot of time this week thinking about egg yolks? Your creme brulee sounds delicious. I say enjoy your raspberries while you can - raspberry diets should be saved for when they go out of season and prices jump to $7 a carton. Oh I have that book! I totally missed this recipe but now it'll be the next I turn to. I've only tried the PB chocolate sandwich cookies from it, which turned out well other than the incorrect yield. Look forward to trying more and seeing what you make from it. In addition to the suggestions above, you can make caesar dressing and coconut egg jam with yolks. To add to Alli's mention of yellow cake above, I think the (amazing-looking) yellow cake in The Craft of Baking actually uses a buttload of yolks. @Xiaolu: coconut egg jam sounds so intriguing--I've never heard of it! What do you have it with?